With much public and industry anticipation, BMW's all-new 2012 M5 has made its official first live appearance at the Frankfurt Auto Show. This is perhaps one of the most highly anticipated cars of this year&apos;s Frankfurt Auto Show. The all-new 2012 BMW M5 comes to us courtesy of the good people from Munich, but unlike the previous generation, the new M5 doesn&apos;t have a V10 under the hood. Power now comes from a twin-scroll twin-turbocharged 4.4-liter V8 with direct-injection and 578hp with 530lb-ft of torque. It&apos;s mated to a seven-speed DCT transmission with Launch Control and according to reports, BMW will be offering a six-speed manual in the near future. It can go from 0 to 60mph in just 4.4 seconds and has a top speed of 155 mph. However, with the addition of the optional M Driver&apos;s Package, top speed increases to 190mph. Other changes from the last generation include features such as regenerative braking, start-stop ignition, and a revised iDrive system. Some enthusiasts aren&apos;t happy about the loss of the V10, but BMW engineers have assured everyone that they won&apos;t be disappointed with the V8&apos;s performance. The prototypes have undergone extreme weather testing throughout the world to guarantee quality. 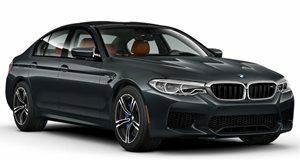 BMW has also recently unveiled pricing, which will begin at $93,000, but various options will easily push it over the $100k mark. The 2012 M5 will be coming to dealerships in the US and Europe in the coming months.